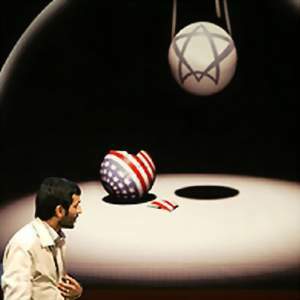 On 26 October 2005, speaking at a seminar entitled "World without Zionism," President Mahmoud Ahmadinejad said: "God willing, with the force of God behind it, we shall soon experience a world without the United States and Zionism." Echoing the words of Ayatollah Ruhollah Khomeini, Ahmadinejad said "As the Imam said, Israel must be wiped off the map." ... saying that Israel and the US are united by a shared terrorist threat has the causal relationship backwards: the US has a terrorism problem in good part because it is so closely allied with Israel, not the other way around. None of these arguments is persuasive? Israel's existence is not in jeopardy? I can't even begin to address such drivel because, for the life of me, I cannot fathom these academics' inability to recognize the moral imperative of Jewish existence and the present threats against it. Hey, I'm one of those Israel "backers." Kol hakavod (all honor) to President Bush... chazak ve'ematz (be strong and courageous). And thank Gd, we don't have to worry this time that he's just trying to get the Jewish vote. Or do we?